This sequence of events is based on real life experience with my three-year-old son. It’s funny and it’s true all at the same time. This list assumes that the toddler is already dressed and clean which is a whole other ball game. Add little sister into the mix and you can count on at least doubling the amount of steps involved. I hope this puts a smile on your face. 1. Tell toddler to go potty and put on shoes. 3. Place toddler in time out because they didn’t listen. 4. Tell toddler they need to listen to mommy. 5. Ask toddler if they are ready to listen to mommy and get up from time out. 5. Tell toddler for the LAST TIME to go potty and put on shoes. 6. Assist toddler in going potty and clean up any messes that were made. 7. Tell toddler to wash hands. 8. Tell toddler NOT to dump the whole bottle of soap down the drain. 9. Place toddler in time out for dumping the whole bottle of soap down the drain. 10. Tell toddler they need to listen to mommy. 11. Ask toddler if they are ready to obey mommy and get up from time out. 12. Spend 15 minutes looking for toddler’s shoes. 13. Assist toddler in putting on said shoes. 14. Grab drinks, snacks, toys, stuffed animals, keys, purse and any other items that you and toddler will need. 15. Tell toddler to follow mommy because it’s time to go. 17. Place toddler in time out because they didn’t listen. 18. Tell toddler they need to listen to mommy. 19. 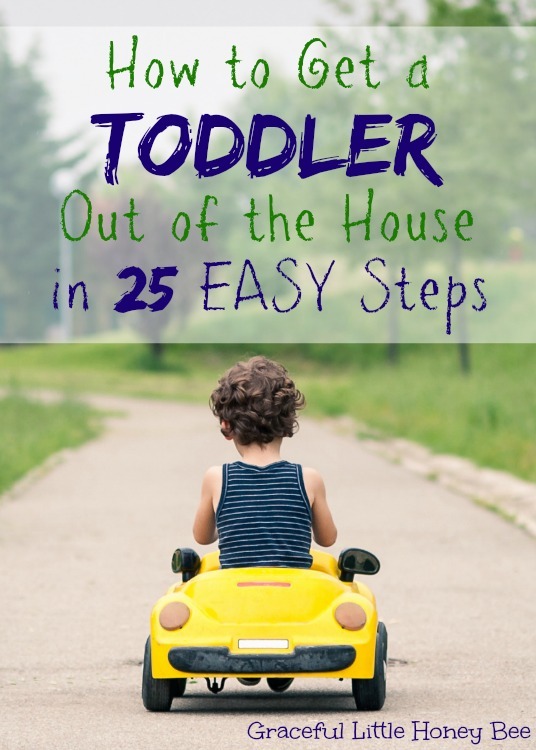 Ask toddler if they are ready to obey mommy and get up from time out. 20. Tell toddler for the LAST TIME that’s it’s time to go. 21. Tell toddler to climb into car seat. 23. Console screaming toddler and tell them maybe they can do it themselves next time. 24. Buckle screaming toddler in carseat. 25. Start car, turn up music and drive to destination.